For more information about this course, you can work your way through the "Certification Details" menu on the left. Register on or before July 17, 2015 - course discounted to $2999! Register after July 17, 2015, course is $3499. Current FEAC CEAs (subject to verification) are eligible to receive 50% off registration. Use FEACCEA as discount code upon checkout. All confirmed registrations must be paid in advance. Special arrangements can be made for select government agencies. Please contact us for these special arrangements. All early bird registrations must be paid by July 17, 2015, or else invoice will be adjusted to regular price. Course registration fees vary from city to city. Click on the particular city and date to see the exact course fee. You can register for any course or seminar by clicking the register button. All payments made on-line are to be made in USD. Prices stated here DO NOT include taxes of any kind. Import duties and/or local taxes/GST/VAT, if applicable, are NOT INCLUDED in prices and must be borne by the registrant. On-site registration will be on a first-come, first-served basis and will be accepted ONLY if seast are available. All confirmed, but unpaid, registrations need to be paid at the venue. All "early bird" discount offerings require payment at the time of registration and before the cut-off date. Any discounts offered (including team discounts) must be paid in advance. All discount offerings may not be combined with any other offer. Zachman International reserves the right to postpone or cancel an event, to change the location of an event. In the event that Zachman International postpones a conference, delegate payments at the postponement date will be credited towards the rescheduled date. If the delegate is unable to attend the rescheduled event, the delegate will receive 100% credit representing payments made towards a future Zachman International event or you may send a replacement. No refunds will be available for cancellations or postponements. Zachman International is not responsible for any loss or damage as a result of substitution, alteration, postponement, or cancellation of an event due to causes beyond its control including without limitation, acts of God, natural disasters, sabotage, accident, trade or industrial disputes, terrorism or hostilities. 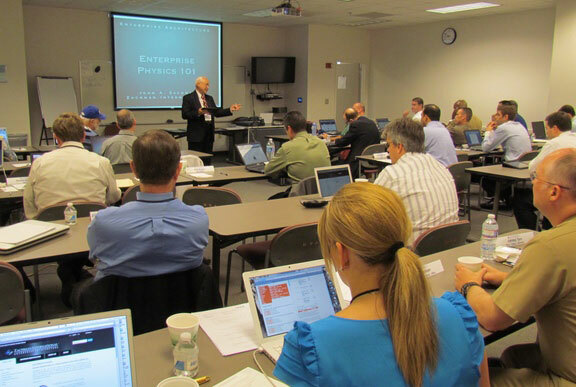 We are proud to announce our 4-day, hands-on Enterprise Architecture training workshop in Washington DC with ONLINE availability! This 4-day training course is designed to build an understanding of the concepts of Enterprise Architecture and develop a sense of urgency for implementing those concepts in a modern enterprise. 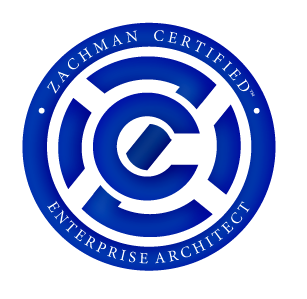 The Level 1 Zachman Certified™ - Enterprise Architect Associate course gives today's Enterprise Architects the opportunity to strengthen their skills as well as broaden their understanding of industry trends and the use of The Zachman Framework™. This course is designed to teach the science of EA- what things exist in the Enterprise, about the ontology, and then equip Enterprise Architects with the help they need to make their own methodological choices. Don't forget to get your copy of the Zachman Framework pdf. Register on our site to get your copy! 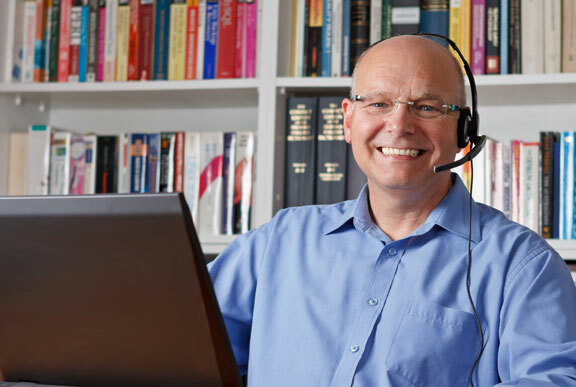 We are proud to offer an online, virtual session of this course! Students must be available at their computer during all class hours. A high speed internet connection is required as well as a webcam and microphone for connection. More info about our virtual sessions. Please select whether you will attend the course live and in person or virtually, on-line at registration. • Register on or before April 8, 2016 - course discounted to $2999! • Register after April 8, 2016, course is $3499. • Current FEAC CEAs (subject to verification) are eligible to receive 50% off registration. Use FEACCEA as discount code upon checkout. • All confirmed registrations must be paid in advance. Special arrangements can be made for select government agencies. Please contact us for these special arrangements. • All early bird registrations must be paid by April 8, 2016, or else invoice will be adjusted to regular price. • Course registration fees vary from city to city. Click on the particular city and date to see the exact course fee. • You can register for any course or seminar by clicking the "register" button or "view all events" button. All payments made on-line are to be made in USD. • You can register for any course or seminar by clicking the register button. All payments made on-line are to be made in USD. • Prices stated here DO NOT include taxes of any kind. Import duties and/or local taxes/GST/VAT, if applicable, are NOT INCLUDED in prices and must be borne by the registrant. • Confirmation of registrations will be subject to availability and timely receipt of payment. • Registrations are transferable within your organization (to a colleague) on request until 2 days before the event date. • On-site registration will be on a first-come, first-served basis and will be accepted ONLY if seast are available. • All confirmed, but unpaid, registrations need to be paid at the venue. • For cancellation, please refer to the "Cancellation Policy" section below. • Registration allows us to use the name of your organization in our future marketing activities as our customer. Purchase Order Please select the "Pay Later" option at checkout, and select "Purchase Order" or "Invoice Me." • All "early bird" discount offerings require payment at the time of registration and before the cut-off date. If payment is not received by the early bird, cut-off date, all open invoices will be adjusted to regular price. • Any discounts offered (including team discounts) must be paid in advance. • All discount offerings may not be combined with any other offer. • 25 days prior to the scheduled date: 10% of total the registration fee will be levied to cover administration costs. In addition, a refund charge of $25 USD is also applicable. • 15 days prior to the scheduled date: 20% of total the registration fee will be levied to cover administration costs. In addition, a refund charge of $25 USD is also applicable. • 5 days prior to the scheduled date: no refund of monies paid. • Registrations are transferrable within your organization (to a colleague) on request until 2 days before the event date. • Note: the above cancellation policy is applicable for confirmed but unpaid registrations as well. There will be NO exceptions to this policy for any reason. We are proud to announce our 4-day, hands-on workshop in London, United Kingdom with ONLINE availability! This 4-day training course is designed to build an understanding of the concepts of Enterprise Architecture and develop a sense of urgency for implementing those concepts in a modern enterprise. The Level 1 Zachman Certified™ - Enterprise Architect Associate course gives today's Enterprise Architects the opportunity to strengthen their skills as well as broaden their understanding of industry trends and the use of The Zachman Framework™. This course is designed to teach the science of EA- what things exist in the Enterprise, about the ontology, and then equip Enterprise Architects to make their own methodological choices. All registrations for the London Course are processed through our partner: IRMUK. Click the Register button below for specific location details and registration information with IRMUK. Register today with IRM UK! Please be sure to review all of IRMUK's registration policies. You can register for any course or seminar by clicking the register button. Click the "Register" button above to see the IRM UK website for details. We are proud to announce our 4-day, hands-on workshop in Washington DC with ONLINE availability! *Regional pricing is available for this course. See "Pricing and Discounts" tab below. Students "live-stream" into the course and must be available at their computer during all class hours. A high speed internet connection is required as well as a webcam and microphone for connection. Early Bird Registration: Register on or before October 14, 2016 - course discounted to $2999! Register after October 14, 2016, course is $3499. Special regional pricing for India: Use discount code INDIA at check-out to see special India regional pricing. *Must have a VALID address from the country of India to be eligible, otherwise registration will not be accepted. All early bird registrations must be paid by October 14, 2016, or else invoice will be adjusted to regular price. Course registration fees vary from city to city. On-site registration will be on a first-come, first-served basis and will be accepted ONLY if seats are available. All "early bird" discount offerings require payment at the time of registration and before the cut-off date. If payment is not received by the early bird, cut-off date, all open invoices will be adjusted to regular price.